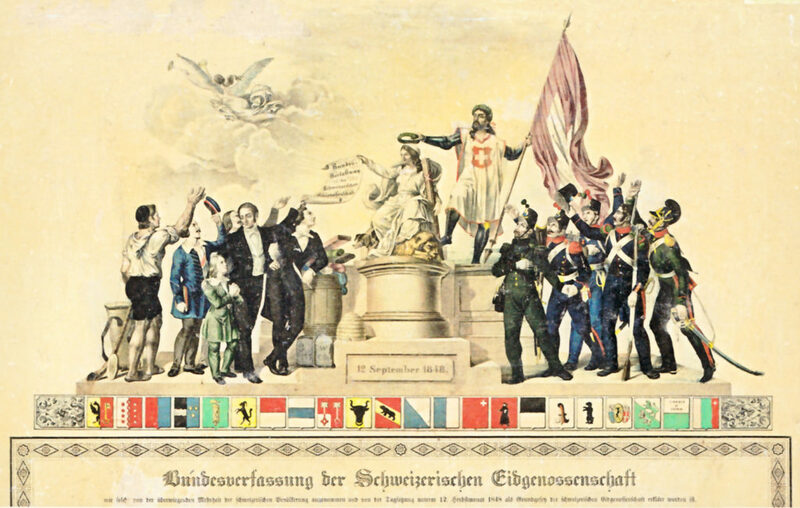 Birth of modern Switzerland and creation of the Federal State. One year later, the cantonal post offices merge and the Confederation takes ownership of the Federal Post Office. The FFA staff regulations come into effect on 1 January 1852. They contain a reference to a permanent position of auditor of accounts. In mid-October, the Federal Institute of Technology in Zurich welcomes its first students. In Switzerland, as elsewhere in Europe, a long period of economic crisis begins. During this time of stagnation, the people approve a revision of the Federal Constitution (with 340,199 voting for, 198,013 against). The Federal State sees its powers increased and its legislative competence extended. The optional referendum is introduced. A new division of labour between the Federal Council and Parliament emerges. The former oversees the administration, while the Chambers of Parliament vote on the budget and the State Account. The latter also undertake high-level supervision. On 19 February 1877, the Federal Council issues a regulation governing the Audit Bureau, at that time housed within the Department of Finance and Tolls. The Bureau is the forerunner of the SFAO. In reality, its creation is an internal reorganisation brought about by the need to audit the military tax and undertake auditing after infantry training is transferred to the Confederation. Moreover, the choice of what to audit is still influenced by the head of the Department, who has the right to issue instructions. The Audit Bureau is run by the former deputy head of the Finance Section of the same Department, Edmond de Grenus. Three staff members from the same Department move to the Bureau with him; only one employee comes from outside. A year later, the assistant of Edmond de Grenus transfers from auditing duties at the Higher War Commissariat. His name is Gustav Pillichody, and he will later become the third director of the Audit Bureau. After a five-year wait, Parliament learns the Federal Council’s position on whether there is to be a Court of Auditors: “In countries that possess one, [it] (…) seems to be an official institution which combines, for opportune reasons that it is impossible not to acknowledge given the circumstances in which the major powers find themselves, competences of a very varied nature, which are partly drawn from the legislature, partly from the judiciary and partly from the civil administration, and which together constitute a whole, which we would be able to insert into our institutions only by means of an amendment to the federal constitution and as a basis of new functions.” (Dispatch of the Federal Council, 30 May 1881, p. 19) Legal arguments aside, it would involve an additional cost of CHF 20,000 to 30,000. The Federal Council’s dispatch and the bill that it accompanies form the basis of the new organisation of the Department of Finance and Tolls. Bendicht Peter becomes the head of the Audit Bureau. A Bernese lieutenant colonel, he is the War Commissioner of his canton. He succeeds Colonel Edmond de Grenus, who takes up national defence duties as War Commissioner-in-Chief. 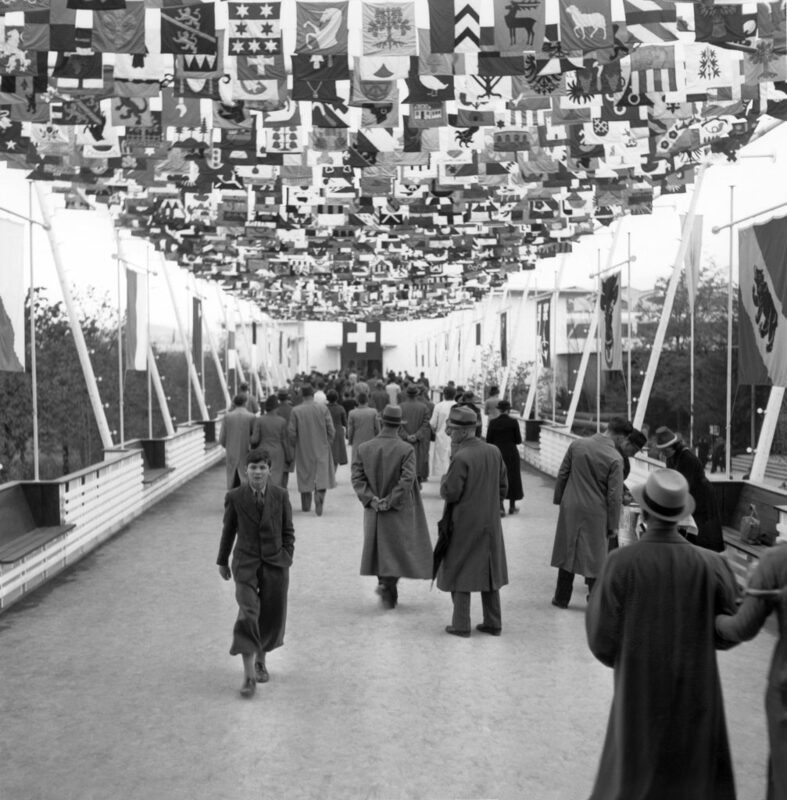 1,741,369 Swiss citizens visit the first-ever national exhibition in Zurich. The federal act dealing with the reorganisation of the Department of Finance together with the salaries and conditions of its officials and employees comes into force on 1 April 1883. Parliament had approved this legal basis on 11 December 1882. It constitutes the legal basis of the future SFAO. 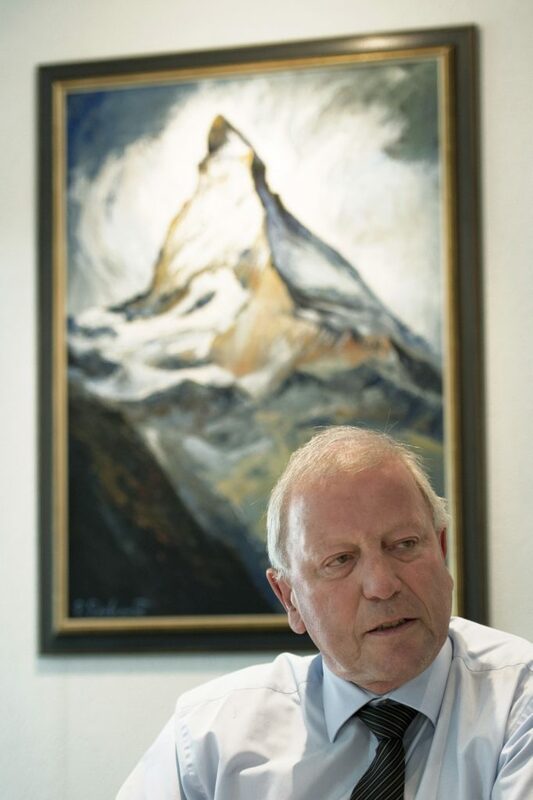 After the death of Bendicht Peter, the post of Audit Bureau Director is filled by Bernese citizen Gustav Pillichody, the former assistant director and principal auditor. 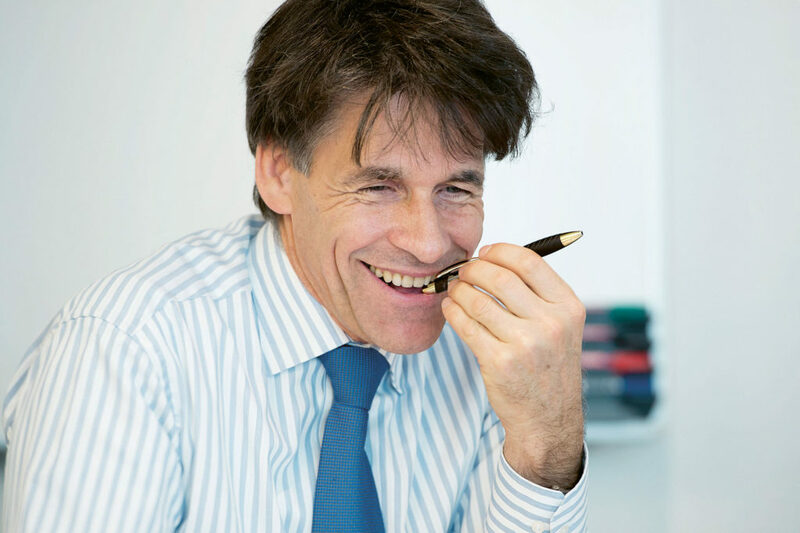 A major in the administrative troops, citizen of Lucerne Franz Siegwart becomes the new director of the Audit Bureau. He remains in post for a record 33 years. Franz Siegwart entered the Bureau in 1882 as an auditor, before becoming assistant director in 1888. In the federal directory, the Audit Bureau is replaced by “Financial Audit”. On 5 March 1895, a committee of the National Council requests that the Federal Council issue a bill aiming to establish a Court of Auditors. There is growing concern in parliamentary ranks regarding the growth of Federal State expenditure and the Federal Council’s lack of administrative control instruments. A postulate is approved by the National Council on 28 June 1895. 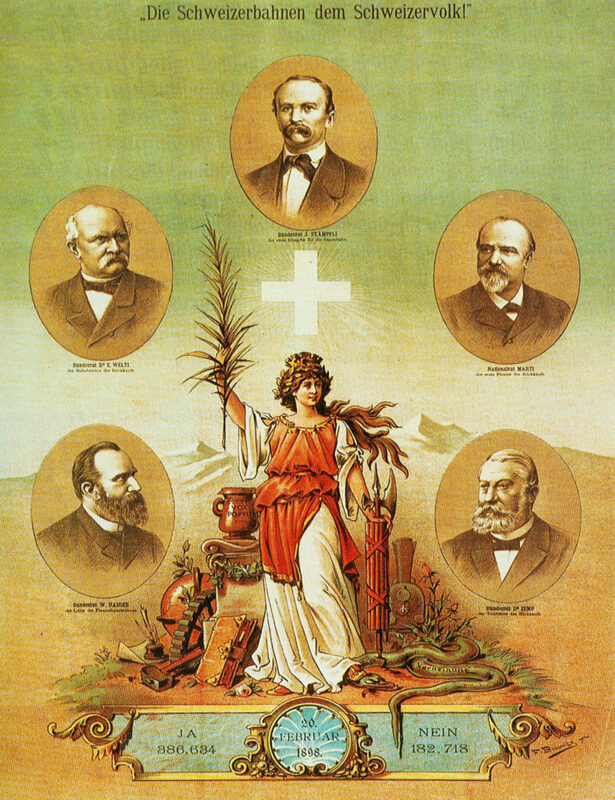 On 20 February 1898, the Swiss people accept the nationalisation of the five big railway companies. This represents the birth of Swiss Federal Railways (SBB), which, that same year, offer their first annual general rail pass at a price of CHF 420 in second class. On 10 December 1900, the Federal Council publishes its report on the creation of a Federal Court of Auditors. The answer is ‘no’. “We are firmly of the opinion that a Court of Auditors, whether it be constituted as a special and autonomous jurisdiction, placed between the legislative power and the executive power, or constituted as a simple auxiliary body of the Chambers of Parliament, designated by them to oversee public expenditure, would provide us with no more benefit than we could obtain easily and without additional expense by perfecting the preventive auditing of expenditures which we already possess in the Department of Finance and by expanding and strengthening the parliamentary control exercised by the Chambers.” (Federal Council dispatch, 10 December 1900, pp. 1032-1033) The Executive suggests establishing a permanent parliamentary committee charged with “auditing all accounts items on a quarterly basis and thus closely monitoring the use of budgetary appropriations”. The matter is discussed by Parliament. Some are critical of the Executive such as the radical national councillor Jules Calame-Colin (NE): “What was enough previously is no longer the case today; the continual development of receipts and expenditure requires new and better control measures […] the creation of a Court of Auditors, although not entirely satisfactory for me in its content, appears vastly preferable”. In the end, Parliament agrees to follow the path traced out by the Executive. 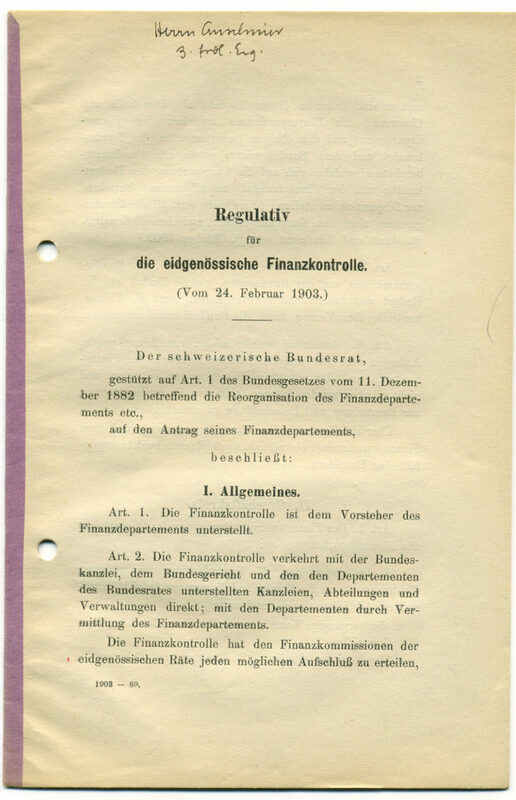 In 1902, they request the creation of permanent finance committees and of a delegation for the monitoring of finances, the forerunner of the Finance Delegation (FinDel). to Parliament. The principle of an institution combining administrative audit and parliamentary audit is born. The SFAO is thus required to supply its information to the finance committees on demand. These committees are also assisted by SFAO staff. With the creation of the Swiss National Bank (SNB), the SFAO is relieved of its auditing duties and responsibility as custodian and administrator of the Confederation’s securities portfolio. 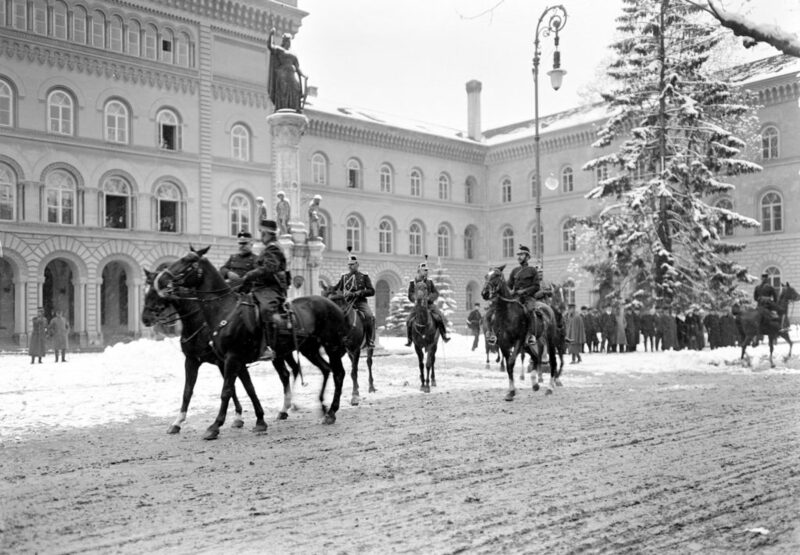 Heir to the throne of the Austro-Hungarian Empire, the Archduke Franz Ferdinand, and his wife, Sophie Chotek, are assassinated in Sarajevo. 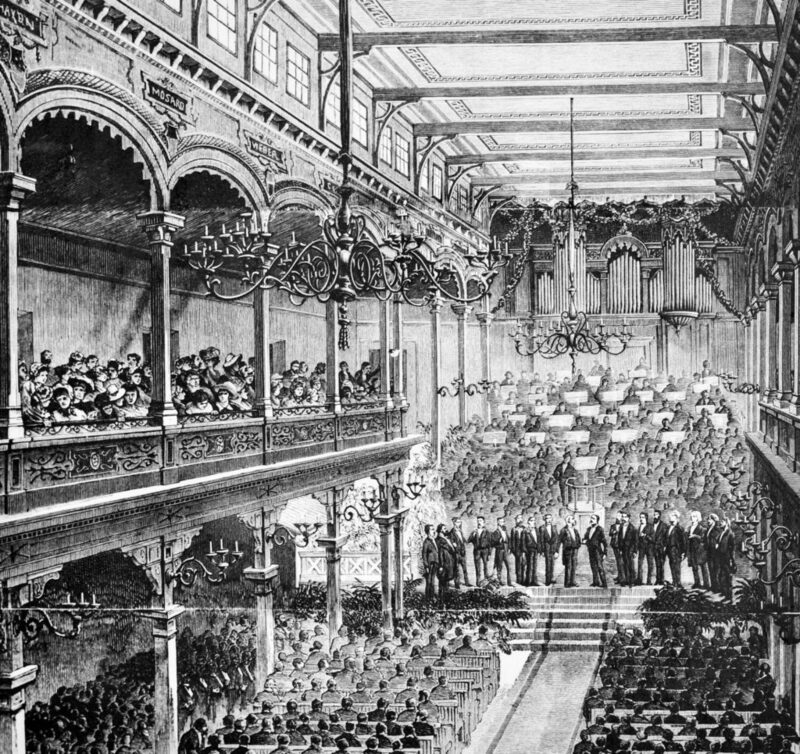 The event signals the start of the First World War. 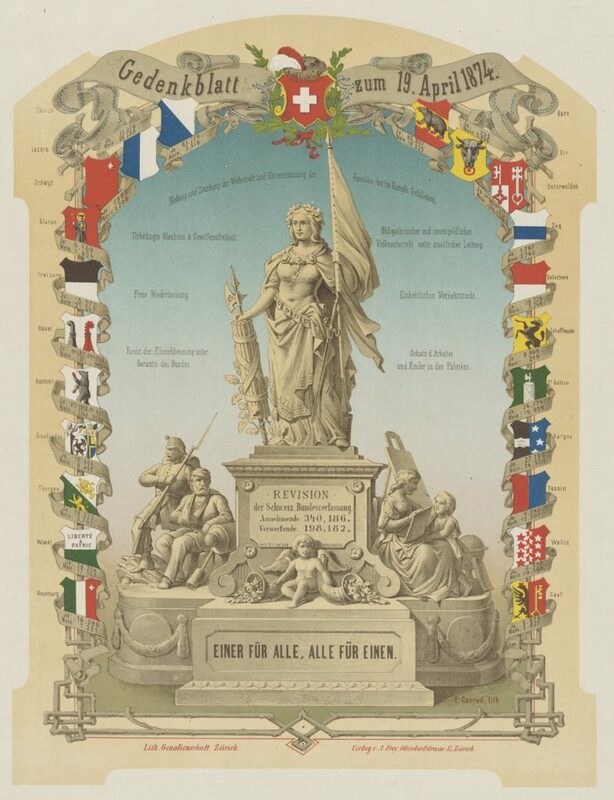 In Switzerland, the third national exhibition opens in Bern. 45 employees, including 19 auxiliaries, now work at the SFAO. Numbers will not be as large as this again until the 1940s. This increase in staff is due to the auditing work brought on by mobilisation. Along with the rest of the FFA, the SFAO is housed on the ground floor of the Federal Palace’s west wing. So why not a Court of Auditors? As part of the 1919 budget, the Council of States adopts a postulate. On 10 December 1918, it invites the Federal Council “to report, after undertaking a new study, on the question of whether it should not be decided to create a Federal Court of Auditors and, if the answer is in the affirmative, what rights and duties should be attributed to that Court”. The SFAO is affected by the influenza epidemic: it gives rise to over 500 days of staff absence. This delays the auditing of accounts by two years, much to Parliament’s displeasure. Russia assimilates its revolution. On 11 November 1918, the Allies and Germany sign the Armistice. It is the end of the First World War. From 12 to 14 November 1918, Switzerland experiences a General Strike. The Department of Finance and Customs moves into the Bernerhof, along with the SFAO. Six years after the Council of States postulate was submitted, the Federal Council replies to Parliament. Once again, the Executive does not want a Court of Auditors. It speaks of a “regrettable political mistake” if such a Court were to be instituted within a federalist system. Improvements to the inspections and working methods of the SFAO are, however, proposed. The Federal Council wishes to reorganise the Department of Finance and Customs to give more autonomy and staff to the SFAO. Among other things, the Executive wants to add the accounting department to the SFAO. Moreover, the Federal Council wants a parliament that oversees the federal finances more effectively – a recurrent theme since the end of the 19th century. To that end, it proposes a post of permanent secretary at the FinDel. In June 1925, the Federal Chambers once again shelve the idea of a Court of Auditors and ask the Federal Council to provide a new regulation for the SFAO. has been head of the payments and accounts section of the Department of Finance and Customs. It is from there, moreover, that he recruits his future assistant director at the SFAO, Charles Droz. The Federal Assembly approves the second regulation of the SFAO on 2 April 1927. It accepts the Federal Council’s proposition of 13 December 1926, which is in line with the suggestions put forward two years earlier. The SFAO’s methods and the nature of its audits are modernised; it also becomes more independent. The internal communication of results and the resolution of the issues associated with them are specified. The SFAO communicates its results to the other departments via the head of the Federal Department of Finance and Customs. However, Parliament refuses to allow the SFAO to be merged with the Department’s accounts section. A new development: a permanent secretary is appointed to the FinDel and to the finance committees. He is attached to the SFAO. This regulation constitutes the legal basis remaining in force until 1967. What place for the SFAO? By means of a postulate, the National Council’s management committee suggests removing the SFAO from the Federal Administration and bringing it under the auspices of the finance committees. The Federal Council declares itself against, and the postulate is withdrawn. 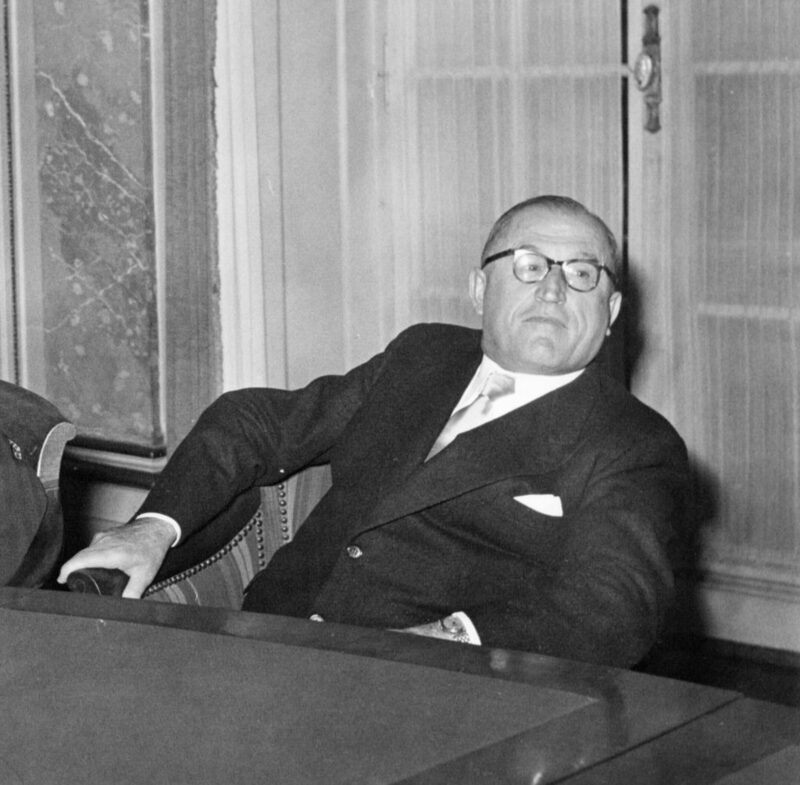 On 26 September 1939, the Federal Council puts in place a group of auditors dedicated to the wartime economy. They constitute a new section of the SFAO, which will exist for the entire duration of the hostilities. Nazi German troops invade Poland on 1 September 1939. The Second World War begins. In Zurich, the “Landi” opens. The country’s spiritual defence is at the heart of this fourth national exhibition. he was secretary of the FinDel and of the parliamentary finance commissions from 1930, and assistant director of the SFAO (1944–1945). Two weeks after the bombing of Hiroshima and Nagasaki, Japan capitulates on 2 September 1945. End of the Second World War and beginning of the Cold War. In Cuba, the International Organization of Supreme Audit Institutions (INTOSAI) is founded in November 1953. The SFAO joins at the beginning of the 1970s. Armin Jeker succeeds Frédéric Rüedi at the head of the SFAO. 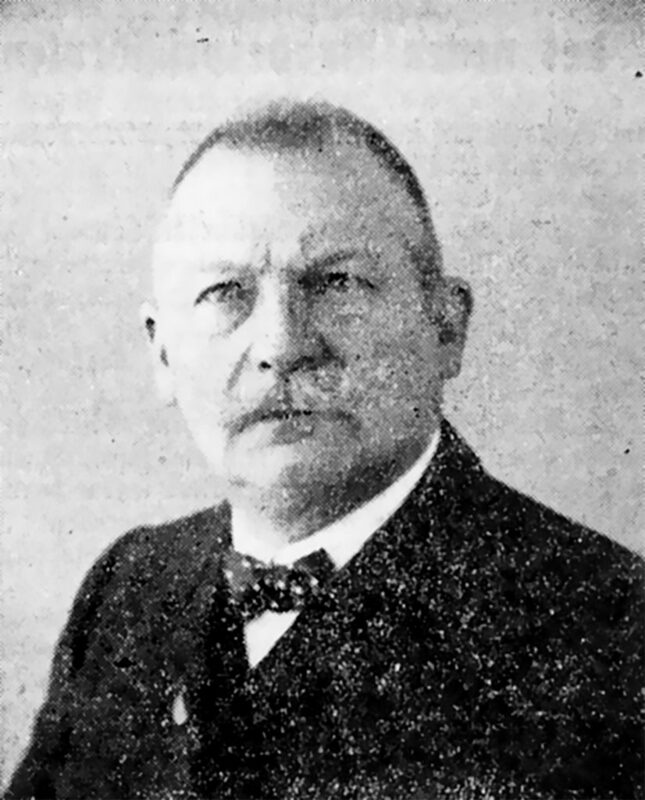 A colonel like his predecessor, he entered the service of the SFAO in 1928 as an auditor. Before his appointment, he held the institution’s number two position (principal deputy to the director). At the request of Armin Jeker, director of the SFAO, University of Bern law professor Rudolf Probst produces a report on the institution, its organisation and its methods. From the outset, this report rejects the notion of a Court of Auditors on the grounds that it would be ineffective. It proposes, however, to base the activities of the SFAO on a law rather than on a regulation. There is no clear boundary between the remits of the SFAO and those of the departmental auditing bodies. This leads to overlaps. The SFAO must be able to propose solutions directly to the Federal Council. A new organisation of this kind implies an increase in staff. After review by the finance committees and the FDF, the report is shelved and remains unpublished. Having occupied until then the position of principal deputy at the Office of the Attorney General of Switzerland (OAG) Eduard Lehmann, of Basel, becomes director of the SFAO. A lawyer by training, he has worked for the Confederation since 1943. 57 aircraft will be manufactured. 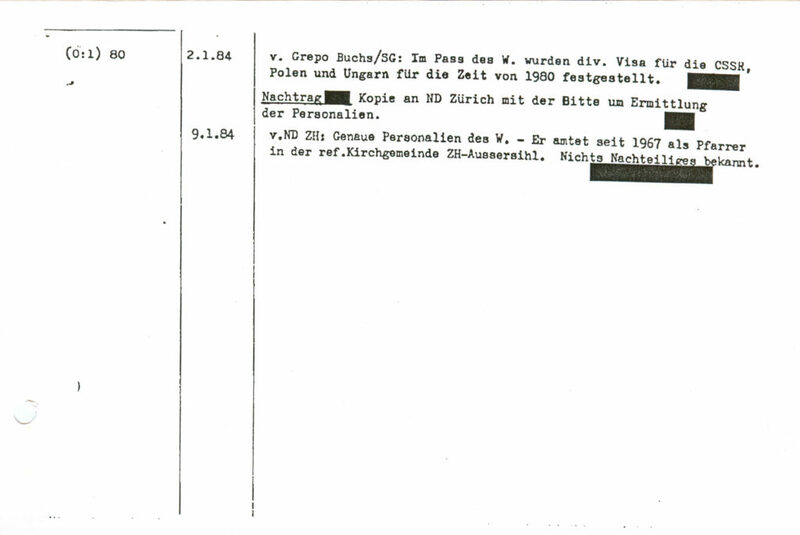 The affair leads to the creation of the first parliamentary investigation committee (PInC), on 17 June 1964. 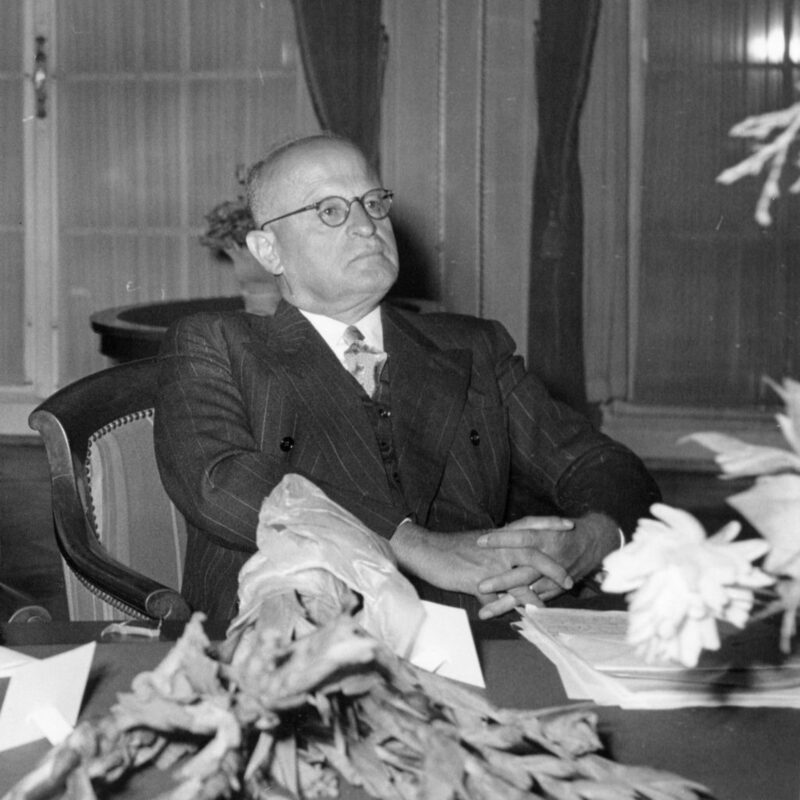 The head of the Federal Military Department (FMD), canton Vaud Radical Paul Chaudet, does not present himself for reelection to his post in 1966 and senior military officers are sanctioned. The PInC wishes to reinforce Parliament’s financial oversight at institutional level. On 15 March 1965, the finance committees request of the Federal Council that an act be passed to reinforce the autonomy and work of the SFAO. A year and a half later, after the cantons, political parties and economic associations have given their opinions, the Executive sends a dispatch to the Chambers, together with its SFAO bill, inspired in part by the Probst report proposals of 1956. 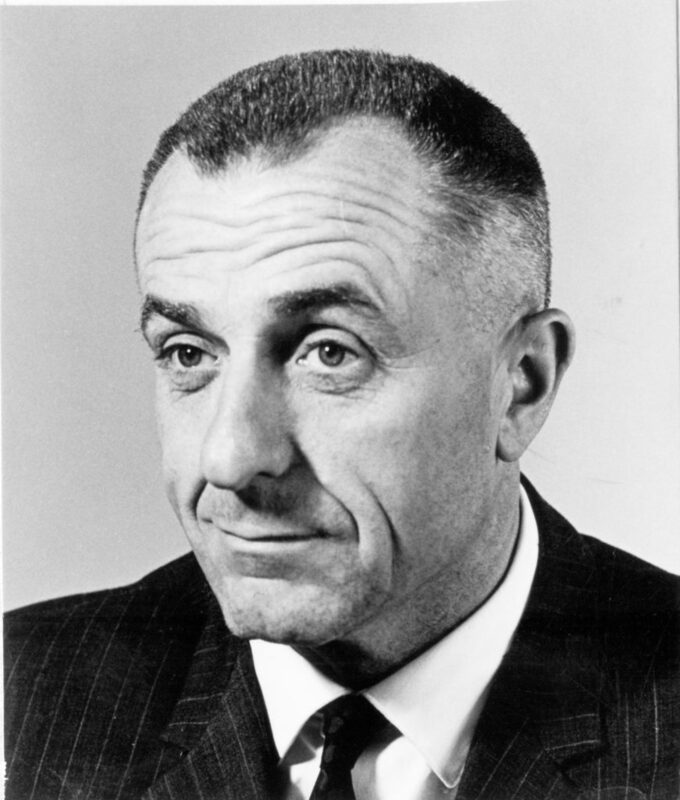 25 October 1964. Over 12 million tickets are sold for this fifth national exhibition. firmed by Parliament’s FinDel. Also appointed by the Executive, the secretary of FinDel and of the finance committees is attached to the SFAO. Staff numbers are set by the Federal Council after consultation with FinDel. The scope of its financial oversight extends to grants, purchases and buildings. On the other hand, neither SBB nor the Swiss National Accident Insurance Fund are included in its remit. The FAOA comes into force on 1 January 1968. 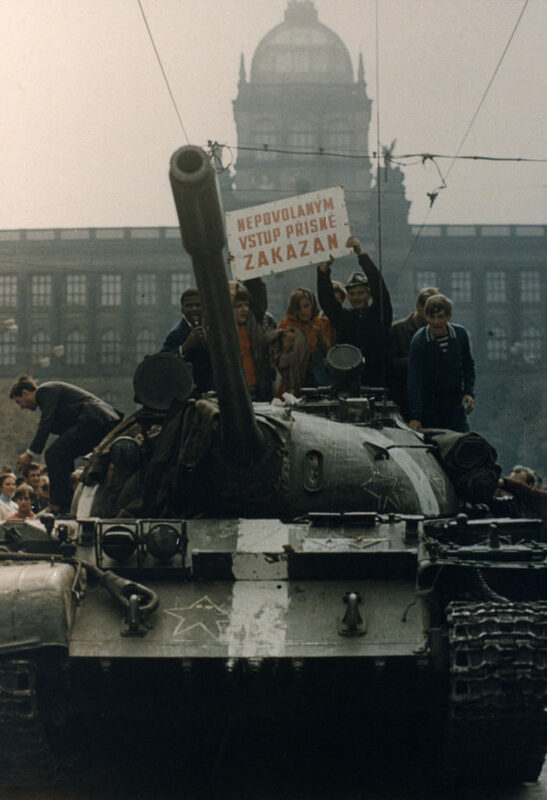 Europe is affected by social movements such as the Prague Spring or the May 1968 demonstrations in France. 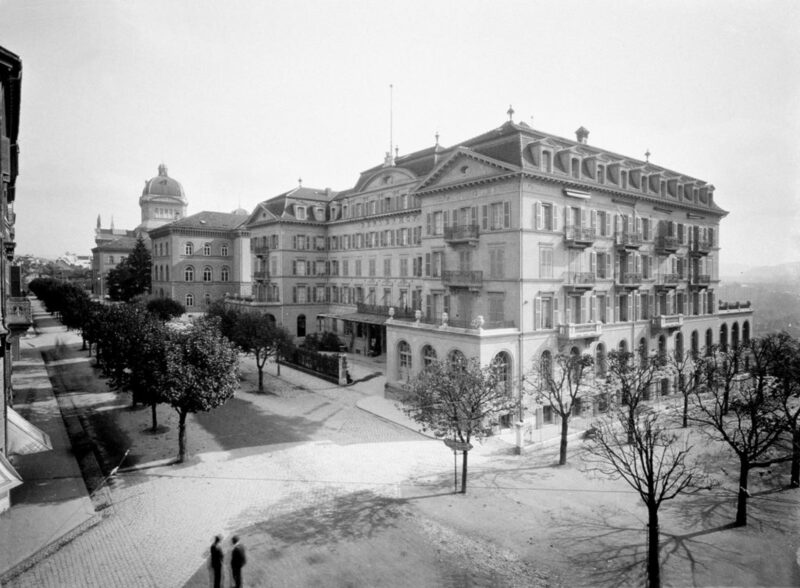 More than a century after the opening of its Zurich forerunner, the Federal Institute of Technology Lausanne opens its doors. In May, the SFAO is reorganised. 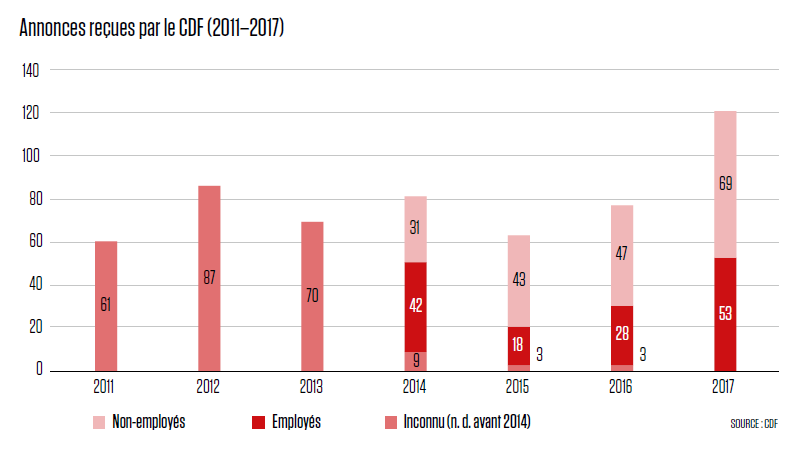 Since 1968, the new act has led to an increase in the number of audits. The SFAO spends 87% of its time countersigning records in the State Account and the payment or transfer orders before they are issued by the administration. Onsite audits therefore take up too little of its time. This worries the FinDel, which commissions an expert report from Professor Rudolf Probst. He recommends that more tasks be delegated from the SFAO to lower audit levels, that new divisions be created, and that its staff be professionalised. Shortly thereafter, two divisions appear on the SFAO’s organisational diagram: “Military Affairs and Acquisitions” and “Federal Grants and Buildings”. In July 1972, its staff receive the first edition of the auditing manual. On 12 September 1970, the Popular Front for the Liberation of Palestine dynamites a DC-8 “Nidwalden” of Swiss national airline Swissair in the Jordanian desert. The Republic and Canton of Jura enters the Confederation. price reviews and large foreign purchases. On 21 October 1984, the Federal Council takes on board its first woman, Zurich Radical Party member Elisabeth Kopp. The SFAO staff numbers 66 German speakers and 10 French speakers. of Justice and Police. The PInC severely criticises the Federal Council member for breaching official confidentiality in the context of the Shakarchi Trading scandal. The committee also reveals that surveillance files have been systematically kept on over 700,000 citizens. In a follow-up to the surveillance files affair, a PInC is constituted to investigate the FMD. It submits its report on 17 November 1990. There exists a secret military organisation, P-26, comprising over 400 men and a number of women. At the end of April, the Socialist group in the Federal Chambers initiates criminal proceedings for misconduct against several highranking federal officials, including Gottlieb Schläppi, director of the SFAO. His role as an auditor in connection with P-26 is highlighted. It is also revealed that a second senior SFAO official, tasked with auditing the Federal Military Department’s purchases, signed off the P-26 invoices. In May 1993, the proceedings are closed by the OAG. In Parliament, the surveillance files and P-26 affairs provoke debate about checks on the administration. 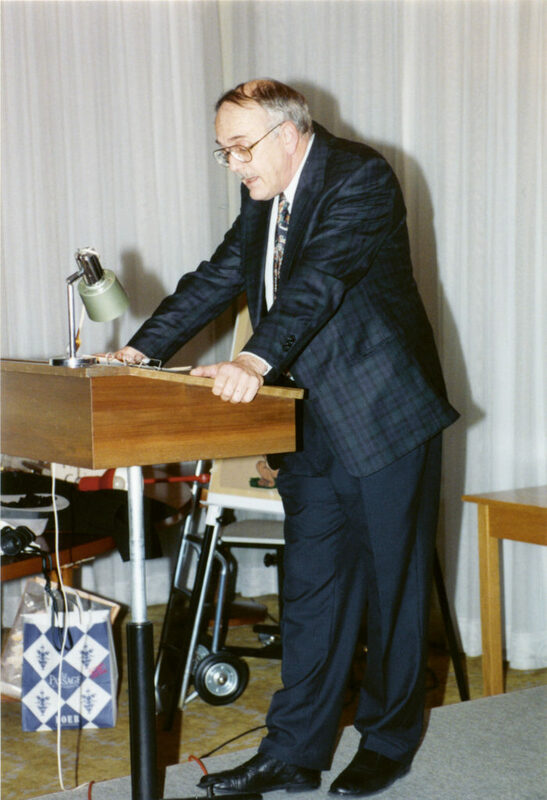 In late 1991, two Socialist Party initiatives are submitted. The first, put forward by Arthur Züger (Canton Schwyz), aims at increased reporting to the Federal Council of serious anomalies discovered by the SFAO (article 15.3). This legal development is accepted in 1992. The second initiative emanates from the Socialist group. It aims to subordinate the SFAO to the Federal Council and to create a Court of Auditors reporting to Parliament. Parliament puts paid to this idea in 1991. On 1 February, the Swiss Post Office introduces A mail, with letters being charged 80 centimes for delivery within 24 hours. Peter Probst takes the reins of the SFAO. He has previously been assistant director of the FFA and head of the main expenditure policy division. At the SFAO, he institutionalises cost-effectiveness checks, which represents a profound change in auditing methods. IT auditing services are also reorganised. In the political turmoil of the 1990s, and within the logic of the INTOSAI international standards, the SFAO initiates with the FinDel a project of partly revising the law on which it is itself based. The proposal is supported by the finance committees, and the Federal Council is mandated to produce a draft. On 7 October 1994, Parliament approves the greater part of this revision. The independence of the SFAO is strengthened. It is a supreme external financial oversight body. Every year, it independently prepares its audit programme and publishes a report of its activities. The auditing criteria now include effectiveness. Finally, like the Swiss National Accident Insurance Fund, the SNB is now excluded from the SFAO’s audit scope. On the other hand, SBB are henceforth included within that scope. IT failures. 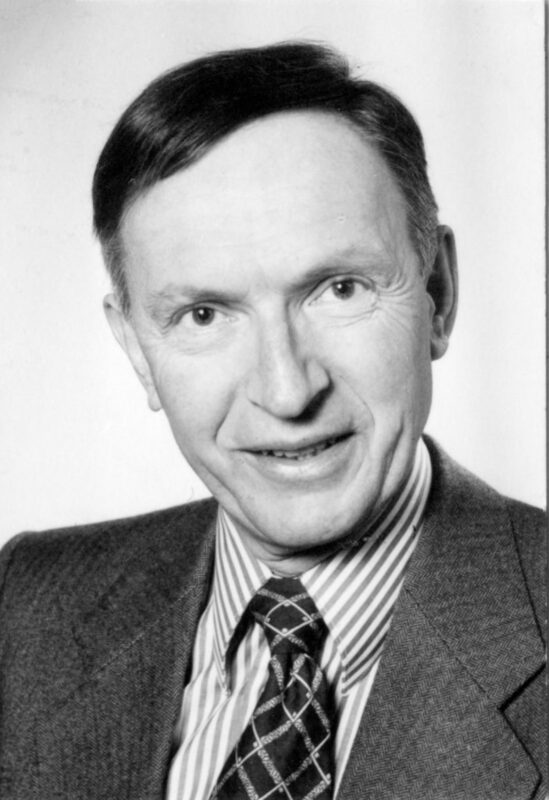 The PInC is highly critical of Socialist former federal councillor Otto Stich, at that time in charge of the FDF. However, trouble was brewing at the FPF. Since 1987, the SFAO has not been certifying its accounts. But the head of the FDF has not reacted to these signals from the SFAO. The PInC believes that the SFAO must be made still more independent. It proposes that the SFAO should henceforward be subordinate not to the FDF, but rather to the finance committees, and that, for the first time, it should be subject to management by Parliament. The PInC also suggests that these committees should be merged and thereby become more effective. 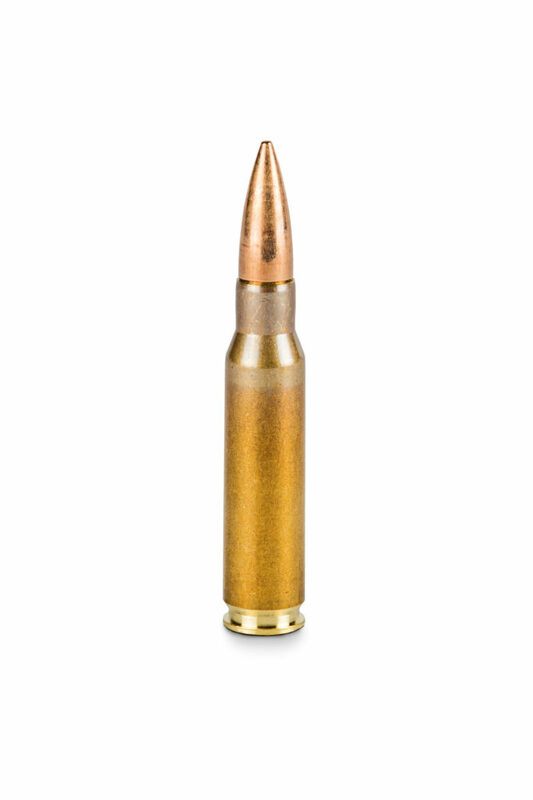 The SFAO audits the prices of a delivery of munitions to the FMD. As a result of this audit, the cost of the contract can be reduced by CHF 440,000. Taking into account the quantity of material still to be bought, the saving realised is close to CHF 3.4 million. K. Grüter, the SFAO completely reviewed its organisational structure and modernised its IT systems. Under his aegis, collaboration with the Swiss Conference of Financial Auditors was strengthened from 2013. This brings together the cantonal audit offices, those of the seven main cities in Switzerland, as well as the SFAO and promotes the implementation of joint audits. cations and staffing policies are left in the hands of its director. Parliament approves this amendment. On 19 March 1999, the SFAO becomes “the supreme external financial oversight body”, subject only to the law and the Constitution. 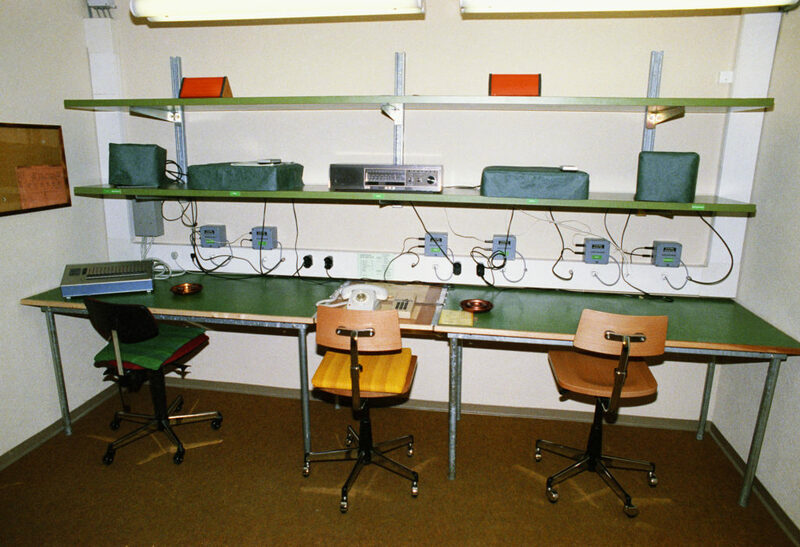 The telecommunications market is liberalised in Europe and in Switzerland on 1 January 1998. This date also sees the birth of Swisscom, the majority of which is owned by the Swiss Confederation. The federal armaments producers become private limited companies, combined to form holding company RUAG, of which the sole shareholder is the Confederation. On 18 April 1999, a majority of both the cantons and the people accept the third Constitution. It comes into force on 1 January 2000.
alised. Thus, over 120 measures are proposed to improve payments processing and to apply the “four eyes” principle. With the new Federal Constitution in force, the Secretariat of the finance committees and of the FinDel is no longer administratively attached to the SFAO. 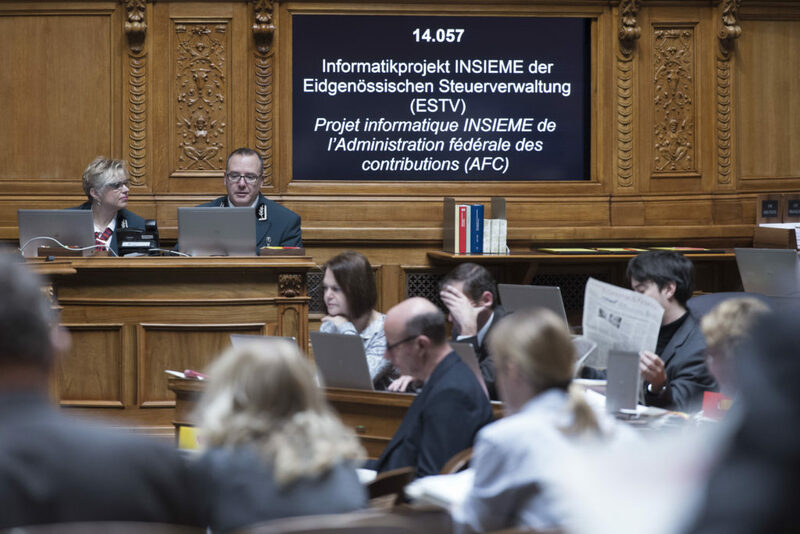 A parliamentary initiative from the Socialist Party national councillor Didier Berberat (Canton of Neuchâtel) calls for more independence for financial oversight in the spirit of a Court of Auditors, as the SFAO is judged to be too close to the FDF. On 4 October 2000, the initiative is rejected by the National Council. of the Swiss Cheese Union. 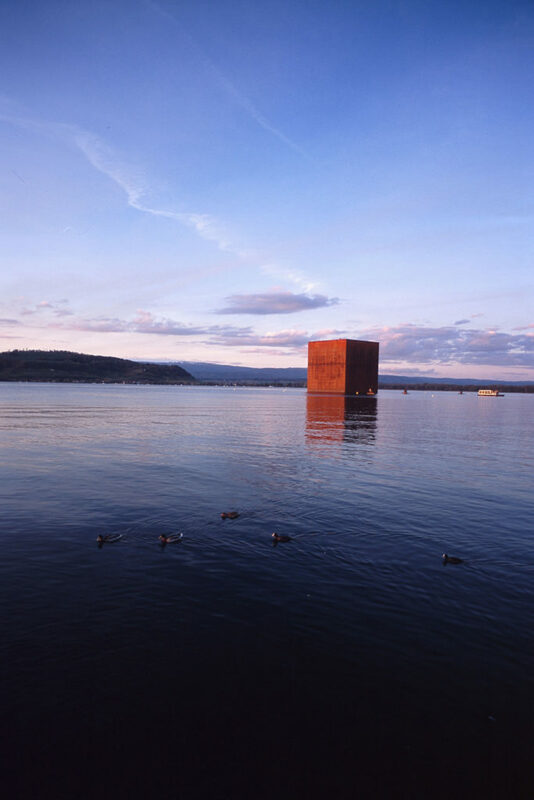 The national exhibition situated around the lakes of Bienne, Neuchâtel and Murten is postponed for a year due to a lack of funds. It finally takes place from 15 May to 20 October 2002. 10.3 million entrance tickets are sold. Three years later, the SFAO’s audit of the Expo 01/02 national exhibition is published. Its title summarises some critical results: “A mandate with unlimited responsibility”. to gather the reported suspicions of federal administration whistleblowers. results are good and the SFAO has put into practice all the recommendations made. Parliament approves the Radio and Television Act. This excludes the possibility of the Swiss Broadcasting Corporation (SBC) being subject to financial audit by the SFAO. The only exception would be in the event of a commission from the department supervising the SBC. cember 2012, the Brazilian mining group Vale International settles its tax dispute and refunds CHF 212 million to the Confederation and the canton of Vaud. On 20 September 2012, after five years of delays, the Federal Council definitively shelves the Federal Tax Administration’s INSIEME IT project. The bill is hefty. Over CHF 100 million have been spent with nothing to show for it. Immediately afterwards, the Federal Council decides to reinforce senior management and from April 2013 entrusts the auditing of major IT projects to the SFAO. Parliament decides to open an enquiry into the INSIEME fiasco. Published in November 2014, its report calls for amendments to the FAOA. gement of the SFAO also decides to fully apply the Freedom of Information Act by extensively publishing its audit reports. 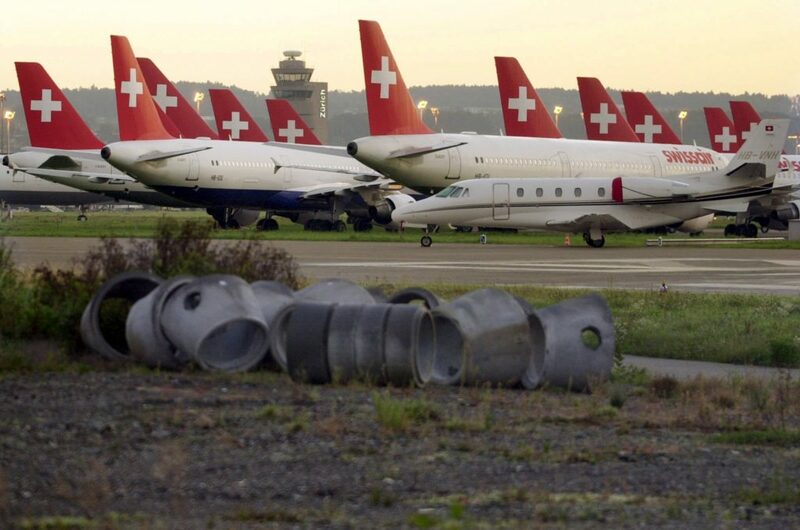 On 2 October 2001, Swissair goes bankrupt. 14 years after Swissair went into receivership, the airline’s liquidator accepts the criticisms of the SFAO regarding the use of the Confederation’s loan. Result: CHF 220 million returns to the federal coffers. 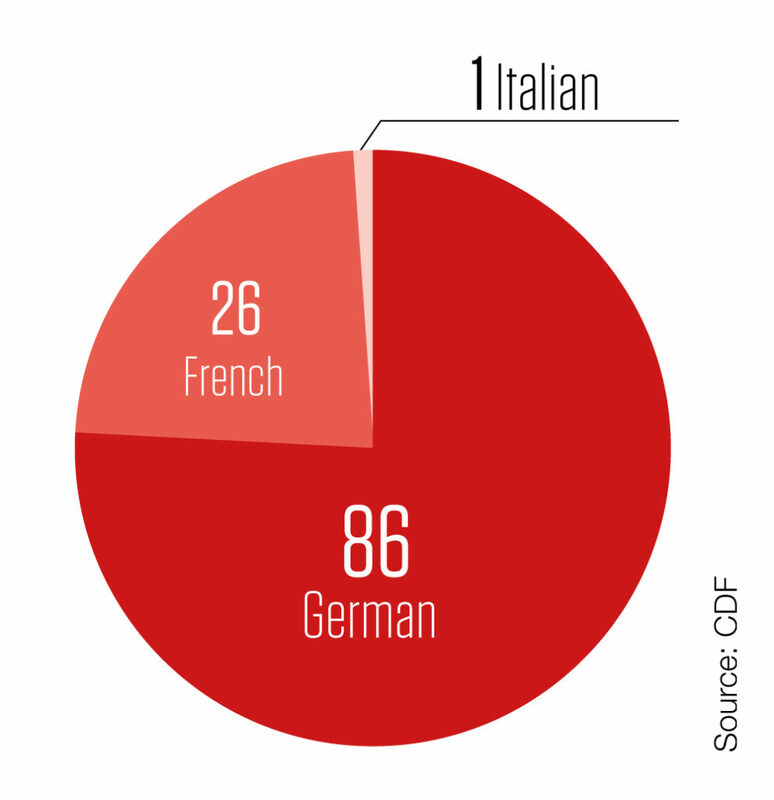 26 French speakers and 1 Italian speaker. 77 of them are men and 36 are women. Following the INSIEME IT project debacle, the Federal Chambers adopt an amendment to the FAOA on 17 March 2017. Among other things, this revision institutionalises the collaboration between the SFAO and the management committees. It also improves the communication of the SFAO audit results within the administration. It comes into force on 1 January 2018.